12th of November, 2015 — Deeper Fishfinder was chosen to be one of the honorees at an annual Consumer Technology Association competition also known as CES Innovation Awards. Deeper was nominated the best innovation among Wireless Handset Accessories and gained CES Best of Innovation award. Smart castable sonar Deeper Fishfinder took part in the awards for the first time this year. However, it already took the nomination. Smart portable sonar was strictly evaluated following special criterias and chosen by a competent jury comprised of on field professionals. All the participating nominees were assessed according to their aesthetic, design, engineering qualities and novelty of their features. Therefore, Deeper appeared to be the most innovative product inside the Wireless Handset Accessories category. 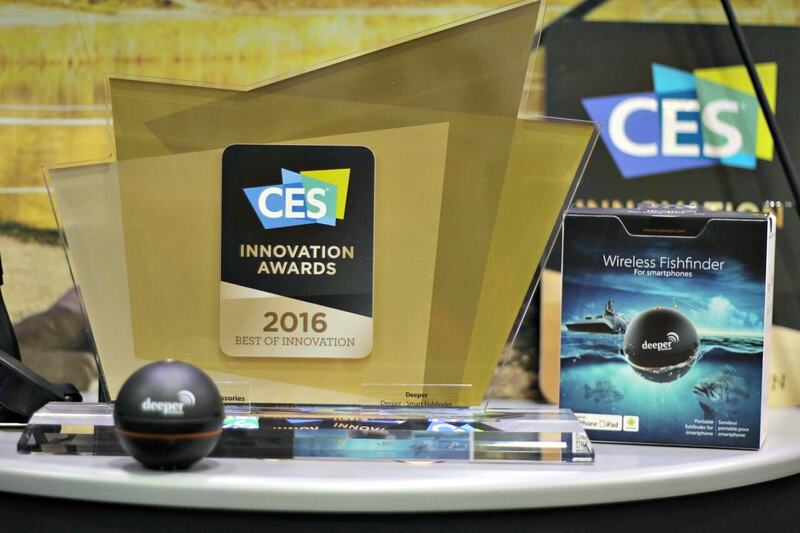 Deeper Fishfinder was also the first fishing gadget ever to win prize at CES Innovation Awards. A CMO of Deeper, UAB – Rolandas Sereika commented, that “core value of our team is bringing consumer innovation to the fishing market and this achievement proves Deeper to be a superb quality and design technological innovation, which is able to compete with other top-notch brands”. CES award is not the first for Deeper this year though. Australian Fishing Tackle Trade Show elected it as the Best Fishing or Boating Accessory of the year 2015 and Fish Alaska magazine ranked Deeper as an editor’s choice. However R. Sereika added, that they have no plans to stop – only to move further – “and CES 2016 prize is yet another stimulus to do so”. The CES Innovation Awards is an annual event honoring outstanding design and engineering in consumer technology products. It features nominations in such categories like Virtual Reality, Smart Home, Software, Wearable Technologies and etc. CES Innovation Awards are implemented during yearly international Consumer Electronics Show – the biggest consumer technology trade event in the world held in Las Vegas, Nevada. Team representing Deeper Fishfinder will be featuring CES 2016 tech show too. Deeper booth will be available for visitors at TW, Sands, Level 2. The number of the booth – #73057. Deeper Team invites all participants to come visit because new and long awaited advancements will be presented at a show. “They will definitely take fishing with Deeper to the next level” – commented Deeper Team members. So once again Smart Fishfinder is ready to show the world that it truly deserves every award it gets and that fishing can be innovative too. In order to find more information about CES please click here.